The leaders of the People's Republic of China have been few in number as the usual term in office is ten years. Here are a set of profiles of the most influential of them. Mao Zedong by Zhang Zhenshi ➚ Image available under a Creative Commons license ➚. Mao Zedong grew up in a rural farming family at Shaoshan, Hunan; although not particularly rich the family was not the poorest either. Many Chinese people still visit Shaoshan as a form of pilgrimage. Mao soon moved to the provincial capital Changsha to study. It was there that he received unlikely support from Yale University ➚ Christian Mission who provided funds for him to setup a bookshop specializing in Marxist material. Without this U.S. support it is unlikely his activities would have brought him to the attention of the Communist party leadership. He built on his Marxist-Leninist revolutionary agenda at Beijing University ➚ 1917-1919. He supported the May 4th Movement that captured the mood of national injury following the Versailles Treaty of 1919. He went on to support the May 30th movement ➚ of 1925. Like many of his fellow leaders he heard the powerful message of Communism from Europe (Deng Xiaoping had studied in France). The Russian revolution ➚ in 1917 proved pivotal, now China had a Communist nation on its border to the north that had a policy of exporting revolution. The message was received with relish not just by the newly formed Communist groups but by Sun Yatsen and other Republicans; Chiang Kaishek went to Moscow to learn modern military tactics. It was only after the First United Front of Guomindang and Communists (1923-27) that mutual suspicion erupted into armed conflict between the two groups in 1927. Thereafter, throughout the Japanese Occupation both sides viewed each other with distrust. Mao Zedong chose to seek support from the rural peasants. This contrasts with the Russian model of fomenting revolution among urban working classes. He chose this method by analyzing the strengths of the Taiping Rebellion and also as a pragmatic choice - the communists had already been eradicated from the major cities. The support by rural communities proved pivotal. After Mao's famous Long March (1934-35) from Jiangxi to Yan'an in Shaanxi he began to receive support from Russia. He was elected leader of the Chinese Communist Party during the Long March at Zunyi, Guizhou and remained effective leader of the Communists until his death. It was during the late 1930s that Mao developed his own brand of Communism taking in appropriate lessons from Chinese philosophy including Mencius (‘When speaking to the mighty; look on them with contempt’); Confucius (‘Not feeling ashamed to ask and learn from the people below’) and Daoism (‘Emperors and Kings do nothing, but the world's work is done... This is the Way by which to have heaven and earth as your chariot, set the myriad things galloping, and employ the human flock’). This break from 'pure' Marxism led ultimately to the break with Russia. At the end of World War 2 the Communists beat the Nationalists (Guomindang) in the race to liberate Japanese controlled Manchuria. With the popular support of the peasants this victory was repeated throughout China and on 1st October 1949 Mao was able to proclaim that China had stood up with the foundation of the People's Republic of China. Mao then sought to transform China, turning from bad old ways. He had a deep mistrust of the intellectuals who he saw as wedded to hierarchical deference and procrastination. His analysis of the reasons for China's failure to defend itself against Japan and earlier the European powers in the Opium Wars, led him to propose a radical shake-up of the class system. A true revolutionary, he gained popular support by obliterating the 'landlord' class who for centuries had kept rural workers in their thrall. He initiated immense construction projects to make good the lack of a modern industrial and transport infrastructure. As the over ambitious reforms could not be managed effectively some did more harm than good and millions died as a result. Initially industrial and technological know-how came from China's Communist ally : Russia. However good relations with Russia collapsed in 1960 ➚ in the Sino-Soviet split. Mao's vision of China and the global Communist revolution was different to that of Khrushchev ➚'s USSR. All technical support was withdrawn and China became an isolated country with very limited contact with foreign nations. After initial Russian technical assistance, China went on to develop its own atomic bomb in 1964. The Cultural Revolution movement grew out of his or anybody's control and led to much suffering by innocent people. His aim was to re-invigorate the revolution by turning the class system on its head again but it went on far longer than a normal 'rectification' campaign. Managers and party officials had already, in his view, become out of touch with the people that they should serve. By punishing the ‘bourgeois tendency’ and replacing them with ordinary workers he hoped that the system would be re-invigorated with a notion of service. The 'cultural revolution' is a misleading name, there was a popular ironic quote ‘The cultural revolution was about doing away with culture’, it was more a large scale rectification campaign as the class structure had not been adequately modified. People were admonished to ‘fight self and oppose revisionism’ revealing it as a campaign to cleanse political thought from back-sliding to old ways of thinking. Mao became subject to a huge cult following, with everyone wearing Mao Badges ➚ and carrying his Little Red Book ➚, such strong loyalty may owe a little to the traditional total Confucian respect given to the Emperor. He was adulated as the ‘Great Teacher, great leader, great commander and great helmsman’ and the ‘red, red sun in the hearts of the people’. Although he stepped back from day to day running of the government, every word he said was carefully scrutinized and slavishly followed. He arrested and shut up any who did not follow his line, they were ‘rightists’ and ‘capitalist roaders’. Anyone who so much as possessed an LP record of Western music was under threat of arrest and a term in a prison camp (as portrayed in the film China My Sorrow ➚). The visit of American President Richard Nixon in 1972 ➚ transformed China's international standing. The P.R.C. was at last accepted as the representative for China at the United Nations (the exiled Taiwan regime had previously taken her place). Bilateral trade agreements with Japan were also signed in 1972. China was no longer seen as part of the Communist world dominated by Russia, indeed China was a counterbalance to ambitions of the Soviet Union. With Mao turning eighty in 1973 the issue of succession became a toxic concern. The appointment of the heir apparent Lin Biao, was made official in 1969; but he was soon charged with an attempted coup ➚ and died in a mysterious plane crash in 1971 apparently fleeing to exile in Russia. Two factions emerged, the moderate reformers led by Zhou Enlai and Deng Xiaoping, and the hard-liners led by Mao's wife Jiang Qing. With the death of Mao's trusted fellow Long Marchers Zhou Enlai and Zhu De in 1976 the succession remained an open question. It was Hua Guofeng who emerged as the unlikely preferred candidate - a compromise between the two factions. Millions mourned Mao's death on 9th September 1976, and many still pass his remains in a crystal coffin at his mausoleum occupying prime position in Tiananmen Square on the meridian that dissects the Forbidden City, reflecting his ambiguity as both ‘Man of the People’ and their Emperor. Liu Shaoqi. Image available under a Creative Commons license ➚. 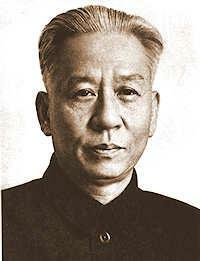 Liu Shaoqi stands as one of the most significant blots on Mao Zedong's legacy. A victim of Mao's crawl back to power Liu died in poor conditions after imprisonment on trumped up charges after being Chairman (effectively President) of China for nine years. A native, like Mao, of Hunan province Liu Shaoqi studied at Moscow in 1921 when Russia was still full of revolutionary fervor. In 1922 aged 22 he returned to China and immediately set about stirring up revolution. By 1932 he was Communist party secretary for the whole of the province of Fujian. In the Civil War, he joined the Long March as far as Zunyi and then moved on to organize resistance in urban centers. In 1937 he joined Mao at Yan'an and became the chief military commander in northern China at the end of the War with Japan. He married five times and had eight children; one son, Liu Yang became an army general. On the foundation of the People's Republic in 1949, he became Mao's Vice Chairman. In 1959 Mao Zedong stepped aside for his chosen successor Liu who then became Chairman until 1967. Liu together with Deng Xiaoping criticized the Great Leap Forward in 1959 and further criticism of Mao's harsh policies followed. For a while Mao and Liu contended for power, Mao had, significantly, retained the important post as head of Military. It was the unleashing of Mao’s Cultural Revolution that precipitated to Liu’s rapid downfall. Liu was arrested as the number one ‘capitalist roader’ in 1967. He was regularly beaten and denied his medication and died in 1969 in utter squalor in Kaifeng. His death and burial was kept secret for ten years. Deng Xiaoping on assuming power in 1980 soon reversed the status of Liu, praising him as a hard-working and true hero of the Communist revolution. Geographical information can be dull and hard to interpret, this heavily illustrated book brings the subject to life with many colorful graphs and diagrams. There have been a number of published editions to keep the information up-to-date. It covers all the main economic and geographic data as well as government organization and the legal system. A very useful way to see how China compares to other countries and how different are the regions that make up China. Zhou Enlai at Meiyuan Xincun, Nanjing, 1946. Image available under a Creative Commons license ➚. 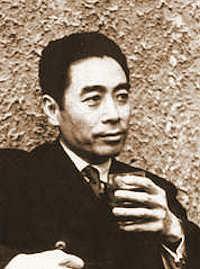 Zhou Enlai was the most widely popular of the revolutionary leaders in China. He was born in Huai'an, Jiangsu although the Zhou family roots are in Shaoxing, Zhejiang. His family served as local government officials. He was adopted by his uncle and brought up by his aunt on the uncle's death. When she in turn died Zhou Enlai was only ten years old, he moved back home briefly before moving to live with another uncle who was working as an official at Shenyang, Liaoning and then Tianjin. His school was a modern one, teaching science and English and Zhou did well. With school support he moved to Japan in 1917 for two years, but he failed to get a place at a Japanese university. On his return to Nankai school (which by then had become a University) his studies turned more to politics and the exciting developments then happening in Russia. His communist activities got him expelled and he decided to leave for Europe on 7 November 1920 to learn more of the social upheavals taking place there. He traveled to the UK; France and Germany and joined a Communist cell in Paris. In Europe he met Deng Xiaoping and other major figures of the later PRC. He married Deng Yingchao in 1925, they remained childless but adopted several children orphaned in the troubles that were to follow, including Li Peng who later became Premier of China (1988-1998). Following Russian advice he joined the GMD (Nationalists) under Sun Yatsen, and led uprisings in Shanghai in 1926-27. Nearly killed by the Nationalists when the Communist-Nationalist alliance broke into armed conflict, Zhou fled to Moscow. He returned in 1928 to mount a communist underground movement. He joined the Jiangxi Soviet as Mao Zedong's boss; he was the effective leader of the Chinese Communist Party until part way through the Long March at Zunyi when Mao took over. Zhou's skills were chiefly in negotiation and diplomacy. When the communists kidnapped Chiang Kaishek in 1936 it was Zhou that negotiated a united front with the Nationalists rather than bowing to hard-line pressure to have him killed. He tried to maintain friendly relations with the Nationalists based at Chongqing. When he gave up and moved to Mao's base at Yan'an he had to apologize for his supposed past mistakes in dealing with Chiang. He took part in negotiations with the Nationalists after the fall of Japan (at Nanjing 1945) but ultimately Civil War could not be averted. On the Communists victory in 1949 Zhou Enlai became Premier - tasked with rebuilding China under Mao's master plan. The Great Leap Forward with its disastrous outcome has to be pinned on Zhou as a major architect. In the Cultural Revolution he tried to defend Liu Shaoqi from Mao's harsh treatment but failed, rather than risk expulsion and death, Zhou again followed the Mao line. Mao's support turned from him to Lin Biao, and it was only after the still mysterious death of Lin Biao in 1971 that Zhou's power grew again. He tried to ease the worst excesses of the Cultural Revolution and this led to disputes with Mao up until his death in 1976. He was always active in foreign relations, and instrumental in setting up the historic Nixon-Mao meeting in 1972. The huge outpouring of grief at Zhou's funeral demonstrated massive support for his political ethos (compassionate and pragmatic). Deng Xiaoping gave the eulogy rather than Mao showing the deep divisions at the top of the party. When 2 million people marked Zhou's death on the Qingming Festival (4th April 1976) the police cleared away the sea of flowers and wreaths that had been left and a riot took place the following day (the Tiananmen Incident ➚). The small group of mourners that remained were arrested and sent to labor camps. The widespread criticism of the Gang of Four did not go unmarked. 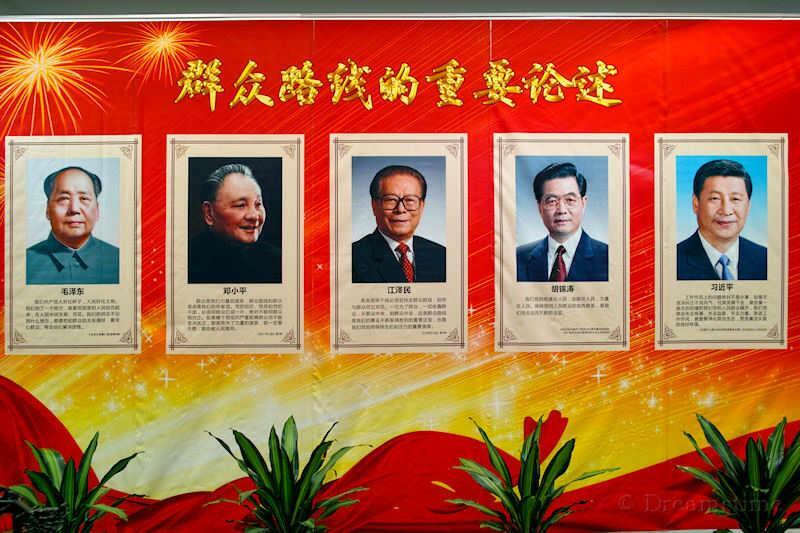 It was not until 1980, when Deng Xiaoping assumed power, that Zhou's legacy and achievements were officially acknowledged. Hua Guofeng. Image available under a Creative Commons license ➚. Hua Guofeng was the Chinese leader during the transitional time between Mao Zedong's death in 1976 and Deng Xiaoping's rise to power in 1981. Born Su Zhu (苏铸) in Jiaocheng, Shanxi in 1921 he joined the Long March in 1936 aged just 15. He took the name ‘Hua Guofeng’ during the conflict with the Japanese. After serving 12 years under Marshall Zhu De in the Army he moved to take a Communist party role in 1947. Hua's competent implementation of the Cultural Revolution in Hunan province gained him Mao's respect. In the early 1970s he rose to national power becoming a member of the Politburo and Vice Premier in 1975 under Zhou Enlai. 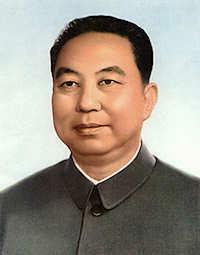 After Zhou Enlai's death (1976) Hua became acting Premier. When Deng fell from grace, Mao made him the official Premier. Mao saw him as a loyal supporter who would continue his vision; Mao is believed to have said 'With you in charge, I am at ease'. When Mao died later in 1976 the Gang of Four sought to maintain their positions of power. It was Hua who arrested them and took on the top military and party roles. As Chairman of the People's Republic (1976-1981) Hua brought an end to the excesses of the Cultural Revolution and sought reform using the model of a centralized Soviet style planned economy. His plans proved overly ambitious; he was opposed by Deng Xiaoping and by 1978 Deng had won the argument within the party and the PLA. In 1979 Hua made the first visit to Europe by a Chinese Leader since 1949; the trip included the first ever visit to the UK by a Chinese leader where he met Prime Minister Thatcher ➚ to discuss the future of Hong Kong. Deng's rise to power in 1981 saw Hua lose all three of his key positions on the grounds of disputes over policy (Chair of PRC; Commander of PLA; and Premier). Hua remained a loyal follower of Mao and his policy of 'Two Whatevers' [ “We will resolutely uphold whatever policy decisions Chairman Mao made, and unswervingly follow whatever instructions Chairman Mao gave” 凡是毛主席作出的决策，我们都坚决维护；凡是毛主席的指示，我们都始终不渝地遵循] neatly encapsulates the policy divide. Deng and his supporters did not want to follow Mao's Thought in every way and condemned the Cultural Revolution, Deng had his own vision particularly with regard to market reform. However Hua repudiated his policies after his fall from power. Unlike the sad fate of his predecessor Liu Shaoqi, only 12 years before, Hua continued in politics, remaining on the Central Committee until 2002. In semi-retirement he turned to viticulture; after a short illness he died on 20th August 2008 which coincided with the Beijing Olympics Games ➚, so his funeral was a low key event, but fully supported by the Politburo. He had one wife and four children. History will probably judge him as a minor figure who acted as caretaker leader between the more influential figures of Mao and Deng. His great achievement was to prevent the Gang of Four seizing power on Mao's death and lurching China into more chaos. Deng Xiaoping during Sino-American signing ceremony, 1st Jan 1979. Image available under a Creative Commons license ➚. Deng Xiaoping's legacy in China is huge. His strategy of softening and widening the strict Communist message is seen as crucial to China's economic revival in the last 30 years. Born in 1904 in rural Chongqing (then part of Sichuan) and known for his thick Sichuanese accent, Deng Xiaoping developed an ambition to study abroad at an early age. A key period in Deng's life was spent in France in the 1920s where Chinese men had been used for quasi-military roles in the first World War. Aged just 16, Deng arrived in France in December 1920, where he worked in a steel plant on the outskirts of Paris. It was in France that he met Zhou Enlai and other revolutionaries seeking to learn more about the West. While working on trains, in kitchens and in factories his spare time was spent studying western thought and science. He took to the game of bridge and gradually became involved in Communist party activities. The authorities eventually caught up with him, so in 1926 he fled to Moscow to avoid arrest. After a year learning about Russian Communism he returned to China a committed communist with news of amazing political and technological developments in Europe. In 1931 he first met Mao Zedong at the Jiangxi Soviet. He took a full and well regarded part in the military campaigns against the Japanese and Nationalists 1937-1949 and became Vice Premier to Zhou Enlai in 1952. In the early 1960s it was Liu Shaoqi and Deng Xiaoping that were in the ascendency over Mao Zedong. But Deng suffered during Mao's comeback during the Cultural Revolution in 1966. He was forced to publicly criticize his failings, and went back to work in a steelworks. People began to show their support for Deng by displaying small glass bottles – his given name means 'little bottle'. His friend Zhou Enlai helped save Deng from the fate that befell Liu Shaoqi and after the Nixon visit in 1973 he was back in power. His rise faltered when Zhou died in 1976 preventing him from becoming Mao's successor. The fall of the left-wing Maoist Gang of Four allowed Deng to return but not without a battle with Hua Guofeng. On Deng's return to power in 1978 he took China on a new route, after the unsuccessful attempt to transform China into a Marxist state. He was the first to openly attack Mao's legacy and firmly steer China in a more market driven direction. Although not officially holding key official posts he remained the ‘paramount leader’ and carefully moved his supporters such as Zhao Ziyang to key positions. A convenient way to think of his leadership is that if Mao behaved like God, Deng behaved like an Emperor. His reforms were only possible in light of America's change of policy after the Nixon visit ➚ in 1972. China was no longer isolated and could begin to trade on international markets. He became the acceptable face of Chinese Communism, pragmatic rather than dogmatic. His most famous saying underlies this view “It doesn't matter whether a cat is white or black, as long as it catches mice”. In other words, following Marxist-Leninist theory is only one means to achieve an end, improving the lot of ordinary Chinese people is the only important end result. He lampooned the Communist tenet that it was ‘better to be poor under socialism than rich under capitalism’. His reforms targeted the discredited Commune system and poor industrial infrastructure. Support for small scale capitalism was introduced. It became no longer a 'crime' to try to better the situation for one's own family rather than the community as a whole. He reformed the education system so that students were credited for academic achievement rather than revolutionary fervor. Deng separated his private and public life, he married three times and had five children. He loved football (soccer) and French food. His leadership style was decisive but within a small ruling group and not presidential. 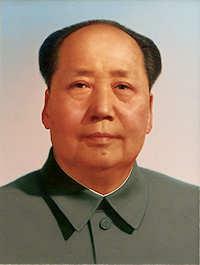 Any tendency to form a personality cult, such as Mao enjoyed, was suppressed. The adulation of Deng's achievements is somewhat marred by the Tiananmen Square ➚ incident in 1989. Although Deng took a back seat he made it clear that the suppression of the demonstration was the correct course. He seems to have seen it as a destabilizing movement with a strong echo of the Cultural Revolution that caused China, and Deng personally, such misery. Deng held firm loyalty to the Chinese Communist Party as the unified, strong stabilizing force it has remained. Hu Yaobang was born to a poor rural family in Hunan. He joined the Communist Party when only 14, he proved a loyal supporter of fellow Hunanese Mao Zedong in the 1930s and took part in the Long March from Jiangxi to Shaanxi. Hu Yaobang was injured in battle and captured by the GMD but managed to escape back to Mao's base in Shaanxi. He became friends with Mao Zedong at Yan'an and led the Communist Youth League on the victory of the Communists. 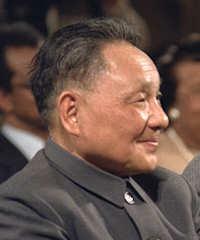 Along with Deng Xiaoping he suffered in the Cultural Revolution when he was given hard labor (including breaking rocks). On Mao's death and Deng's rehabilitation he rose to power to become General Secretary and effective leader of the Party. His abandonment of Mao's philosophy went further than Deng. He encouraged and adopted some Western practices. He openly questioned Marxist ideology and sought to extend accountability of the leadership. While Deng was paramount leader Hu remained his 'left hand', he rehabilitated many people who had been criticized under the Cultural Revolution. By the mid 1980s Hu became critical of Deng himself and upset many senior figures by instigating anti-corruption investigations. It was the widespread student protests in 1987 demanding Western style reforms that led to Hu Yaobang's downfall. The elder, senior members were increasingly unhappy with Hu's apparent acceptance of the demonstrator's rights to protest and also the high speed of economic reform. Deng Xiaoping stepped in and removed him from the office of President although he remained as a member of the ruling SCP. His death on 15th April 1989 from heart failure sparked the student protests in Tiananmen Square which were brutally suppressed by Deng. It was not until 2005 that he was rehabilitated as a great Chinese leader. He is now remembered as the leading reformer of his generation. Jiang Zemin by Presidential Press and Information Office, Moscow. Image available under a Creative Commons license ➚. Jiang Zemin remains an influential figure in Chinese politics from the time he was President and Paramount Leader 1989-2002. He represents the head of the third generation of leaders after the formation of the People's Republic and the first not to come from a military background. Jiang was born in Yangzhou, Jiangsu province and was too young to take part in the war against Japanese occupation. He became the adopted son of his war-hero uncle Jiang Shangqing ➚. In 1947 he studied electrical engineering at Shanghai University, he then went to Moscow in the 1950s and worked at a car factory. On return to China he gradually rose through the ranks of the communist party and in 1983 became Minister for Electronic industries. He was made mayor of Shanghai, an important position in a rapidly growing city. This appointment gave him prominence at a National level. His position strengthened after the Tiananmen Square Incident, Deng saw Jiang's handling of similar protests in Shanghai as firm but not brutal. So when Deng ejected Zhao Ziyang, Jiang Zemin became the front runner to replace him as General Secretary of the party. Deng moved to promote him to the other key posts of President and head of the Armed services on Deng's semi-retirement in 1990. Knowledge of and the support of the PLA remained an essential requirement for leadership in China. 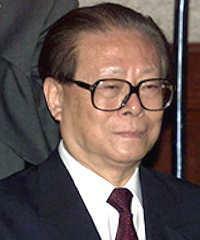 Jiang replaced Deng as 'paramount leader' in 1992. He instituted a rethinking of policy after the Tiananmen Incident with a more effective method for spreading the party line. Deng did voice some criticism about the pace of economic reform that Jiang initiated, stimulating Jiang to declare China as a 'socialist market economy' rather than a communist one. After Deng's retirement and then death in 1997 Jiang Zemin bolstered his power base by promoting some of his Shanghai supporters, most notably Zhu Rongji. He battled against rising crime and took measures to control the unprecedented flow of people to urban centers. He set up Special Economic Zones (Shenzhen, Xiamen, Shantou, and Zhuhai) mainly in Guangdong. In 1997 he visited President Bill Clinton ➚ in the U.S.A and in 1999 he cracked down on the Falun Gong sect ➚ that was considered a subversive threat. Sometimes his avuncular personality led to criticism, he was not a distant revered leader like Mao, he delighted in jokes and informality. Following on from previous Paramount Leaders he made his own contribution to China's guiding principles. His 'Three Represents' 三个代表 can be summarized as Represents China's advanced social productive forces (importance of economic development); Represents the progressive course of China's advanced culture (development of cultural identity); Represents the fundamental interests of the majority (maintenance of people's mandate). After he stepped down in 2004, Jiang has continued to exert influence on his successors from behind the scene and is now the leading elder statesman in China. Hu Jintao. Image by Dilma Rousseff ➚ available under a Creative Commons license ➚. Hu Jintao was the Paramount Leader of China 2002-2012 and has been seen as an efficient bureaucrat leading China through a period of rapid economic development. 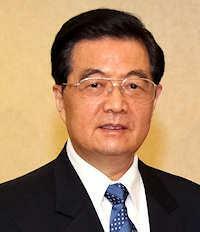 Hu Jintao was born in Taizhou, Jiangsu into a relatively poor family. His father suffered under the Cultural Revolution a fact that probably led to Hu's alignment with Deng Xiaoping's faction. He did well at school at Taizhou and went on to Tsinghua University, Beijing studying engineering and marrying Liu Yongqing. In 1968 he moved to Gansu to work on a hydro-electric plant as an engineer. In 1973 he began his political career, and with the help of central party initiatives to promote new talent, soon rose through the ranks of government. In 1982 he trained at the Central Party School in Beijing and then headed the Youth section of the party. Spotted by General Secretary Hu Yaobang as a rising star he was moved to be Party Secretary for Guizhou Province in 1985. After the Tiananmen Square Incident and Hu Yaobang's fall from power, Hu was moved to take on the challenging job of Party Secretary for Tibet. By 1992 Hu Jintao was already being groomed as a potential leader by Deng Xiaoping and the other leaders; he joined the inner circle of the Standing Committee of the Politburo. In 1998 he became a Vice-President and a smooth hand-over from Jiang Zemin took place in 2002. Like previous leaders he has made a modest contribution to extending the founding principles of the Peoples Republic. His ‘Eight Honors and Eight Shames’ have been widely promoted: Love the country; do it no harm. Serve the people; never betray them. Follow science; discard ignorance. Be diligent; not indolent. Be united, help each other; make no gains at others' expense. Be honest and trustworthy; do not sacrifice ethics for profit. Be disciplined and law-abiding; not chaotic and lawless. Live plainly, work hard; do not wallow in luxuries and pleasures.. The delivery of principles like this go back as far as the Qing dynasty when Emperor Kangxi set out his sixteen maxims. The fight against corruption was an ongoing battle; despite extensive use of the death penalty against corrupt officials, corruption is considered all pervasive. Placing a bribe remained an essential part of sealing a deal in China. Seen as lacking the charisma of previous leaders and being a creature of the Party machine, Hu's contribution is seen as just continuing the reform policies set in motion by Jiang Zemin. He governed with caution and restraint, striving to balance the development across the country, reassuring underdeveloped areas that their time will come. He has married once and has a son and a daughter. His hobbies include dancing and table tennis. DoD photo of Xi Jinping by Erin A. Kirk-Cuomo. Image available under a Creative Commons license ➚. Xi Jinping was born in Beijing but his family has roots in Shaanxi province. His father, Xi Zhongxun ➚, was a leader of the Communist party from its earliest years rising to be Vice Chairman of the NPC. His father had friendly relations with the Dalai Lama and was jailed during the Cultural Revolution. Xi Zhongxun went on to manage the creation of the Special Economic Zones (SEZ) in Guangdong under Deng Xiaoping's leadership. At the age of 16, Xi Jinping worked in Shaanxi while his father was in jail. In 1975, at the age of 22 he returned to Beijing to study Chemical Engineering at Qinghua (Tsinghua WG) University. He went on to take junior posts in the Communist party in Shaanxi; Hebei; Fujian and Zhejiang. In 2006 he was appointed party secretary in Shanghai. This was a significant step as it is the natural stepping stone before joining the ruling SCP. Seen as a safe pair of hands and untainted by political scandal he rose to be the heir apparent to Hu Jintao. He is perceived as competent, easy-going and affable with a large network of contacts. Broadly his policy is characterized as economically liberal but politically conservative. He has promoted the aspiration to a ‘Chinese Dream ➚’ somewhat akin to the American Dream ➚ where anyone can aspire to be rich by hard work. He has launched initiatives against corruption which have led to the downfall of some noted senior figures within the party such as Bo Xilai ➚. Since 2016 he has taken on more personal power than his immediate predecessors. He does no consult other senior figures in the party and has been given the honor of having his 'thought' embedded in the constitution of the country rather like Mao Zedong. 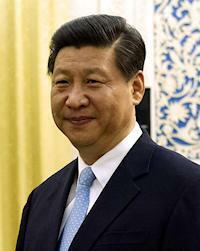 Xi became President in 2013 and is likely to serve the normal term of ten years. However in February 2018 his term was made indefinite. He is the third successive president to have an engineering degree. He has married twice, his second wife Peng Liyuan ➚ is a famous singer. They have one daughter, Xi Mingze ➚, who studied at Harvard University. Citation information for this page : Chinasage, 'Chinese Leaders from 1949 to the present day', last updated 6 Dec 2016, Web, http://www.chinasage.info/leaders.htm.